Actresses, Castings & Bulletins, Events, NEWSFLASH! So finally, I’m moving forward with an idea I first had almost two years ago. The theme of the film is based on something that happens in many relationships, so it will be a point of interest for those that see it. There will be twists of humor and drama. For anybody that would like to be involved as an investor, sponsor, producer, you can email me at chris@imtmworldwide.com. I’ll send you a non-disclosure agreement and if you send it back dated and signed, I’ll send you details and investor package information. The film will be shot in Atlanta, submitted to film festivals both national and abroad, and there is a tv pilot also in the works. 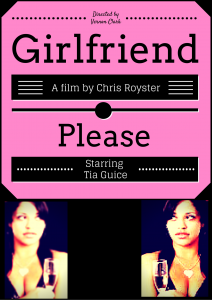 Starring Tia Guice. Vernon Clark will be directing. Auburn this for you and all that truly “aspire” to do more!!! !